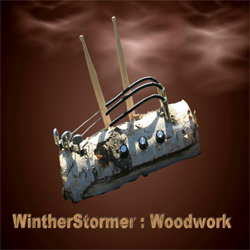 WintherStormer released their first CD called "Woodwork" in 2007. Recorded, mixed and produced by WintherStormer in January 2007 - see photos here. It was cold, wet, dark and slippery, and we had to haul a lot of gear in the rain and snow, but we really enjoyed being all alone to record our music in a controlled enviroment. We lit the fire, made some good food, set up and recorded everything "live in studio". The original English and Norwegian press releases available for download. Bajkal Records 222016, released June 2007. The first studio CD by WintherStormer. Four musicians make up this Norwegian band; Terje Winther (synths and electronics), Erik Stormer (synths and electronics), Atle Pakusch Gundersen (guitars and electronics) and Geir Marthin Helland (drums and percussion). Their profile is live performance on analogue equipment only, completely without computers, but some live, manual programming of sequencers. They have been performing as a band since 2002 (though they are all experienced musicians since the 70s) and Woodwork is their debut album as Wintherstormer. It features 4 long tracks where the shortest is just over 8 minutes. The album opens with Pure Analog Forever, a title which describes not only the album but also Wintherstormer as a band. Electronic swooshes, bleeps and plops and gentle percussion form the intro, before a calm and warm bass sequencer slowly fades in to form the structure of the track. Space chords and live improvised leads fill in, and the track ends with the sequencer, percussion and lead going haywire until they all end abrubtly, like a controlled improvised session. The second track Musical Equitation Extracted From Firelogs, is more of an ambient sound-sculpture track with only a slow-ish 4-step sequencer coming in halfway as the typical Berlin School element. Not a sequencer fest by any means, but in stead a mysterious and fantasy movie soundtrack-like "dream painting" of vocoder voices, broad space chords, and abstract percussion. The shortest track, Engraved, starts with a delicate and bubbly sequencer, but only for a few moments before some jazzy rock percussion takes over, supported by a screaming fuzzy sequencer pattern and electric guitar that compliments the live rock drumming. The track continues in this fashion, alternating between calm, soothing electronic sequencer landscapes and aggressive energy bursts. Quite a departure from the two previous tracks, but the drumming and guitar elements of Wintherstormer is unique in a perfectly integrated way, where the percussion and drums are as sculpted and sound-designed as the electronic elements. Almost a conversation between contradictary persons, this track. Monochrome clocks in at over 35 minutes and starts out as a classic Berlin School track with a multi-layer 8-step running sequencer pattern that is manipulated and added to, and supported by electric guitar, bass and spacious percussion. The tracks grows fatter and more inhabited as it runs along, including some improvised lead playing, until about halfway through where more jazzy drums and fuzzy guitar jump in and gives the track a more progressive attitude (not necessarily prog-rock though). The band shows on this album and during live performances that their basic frame is Berlin School music, but they have taken this style one level further by doing it all completely live, like it should be and like it once was. Perhaps I should say they have taken it back to basics. There are many glossy and well produced Berlin School albums out there that perhaps better resembles the icons of the genre, but Wintherstormer manages to get alot of energy from their playing and it's all very organic and vibrant, even if the production is not as perfect as some studio competitors. But on Woodwork, technical perfection would take away, not add. Wether recorded in one take or not (it certainly could be), Woodwork is probably the best album of it's genre to come out of Norway ever, if not the only one, and a very promising first release from a band you definitely need to follow in the coming years. Like thousands sound of prism, resulting from a musical hologram in fragmentation, the first stammerings of Pure Forever Analogue plunges us into an eclectic world where sound paranoia reigns in a primal din. The loops of ions undulate in a piercing static to form a bass line which curves in a cosmic path where the heteroclite and the schizophrenia of the sound waves are kings. Gently, this domesticated uproar moults is muting in a beautiful sober and melodious synthesized line which melts in the ear such as honeyed mellotron. Synths are unctuous and very enveloping, travelling in monotonous chant mode on beautiful violin arrangements pads which mix its musical fluids to synthesized guitar waves. Great progressive electronic music, where languorous tribal tam-tams and raw riffs open the doors to a kind of cosmic serenade with a soft Hindus essence. Musical Equitation Extracted from Firelogs is a very dark title, with rich and extremely enchanting atmospheres. A long ambient tirade where the synthesized breathes float in a cavernous ambiance. The sound stalactites are dropping to form dense ghostly waves which undulate in a current with weak harmonious litanies, as of sibylline chorus which walk slowly into the darkness of the center of the earth. From calms to acrimoniously, Engraved breaks such a musical psychosis where two contradictory entities exchange harmony and cacophonous flood. Light spiral keys ravel in short sequence harmonious passages, to let the melody to large inopportune outbursts sound with heavy riffs, unbridle percussions and synths with powerful solos. A great musical moment, where you will have to be vigilant in order to avoid the smashing of your tympanums, just before hearing the astonishing Monochrome. A long minimalist track which begins on a superb fluty mellotron, followed by some very Tangram sequences. A superb bass line emanates from this opening to curve in a long sinuous movement to which are added layers, as much melodious as musical, of hatched and crankshafts synths on a spectral sound setting. A bewitching architectural procession, with innumerable sound jolts which evolves in a musical universe as much electronic as progressive. Although not easy of approach, WintherStormer Woodwork is this kind of album which makes the listeners glide and float, which gimlet our nostalgic ashes. An intense music with a very avant-gardism approach which gains being tamed. To get an idea of the unique mix of instrumentation on Woodwork, one needs only look at the cover art  a log with patch cables, synth knobs, drumsticks, and guitar tuning pegs. “Pure Analogue Forever,” reminds me of some of the more freeform experimental stuff by Radio Massacre International. A low slow sequence fades in around 5:00, with some warm synths surrounding it, along with just a dash of percussion, gentle cymbals mostly. Dueling synth leads dance back and forth later on, or perhaps it’s a guitar and a synth; an effective and promising opener. Soft chimes are joined by assorted electronic sound effects in the second track. Modulated male choirs are prominent later on, and a quirky 4-note pulse adds a bit of structure but not much. “Engraved” starts softly but then pounding drum beats turn it into hard-hitting space rock. The drums disappear, come back, disappear, and come back again. Both sections are cool in their own way, but the manner in which they are spliced together sounds like taking turns in a musical argument. By now I’m not quite sure what to expect of the 35-minute closer, “Monochrome.” Soft synth flutes and a light sequence start things off, and it develops in largely traditional Teutonic fashion, with a dash of prog rock toward the end. This is excellent retro music that is different enough to offer a fresh perspective without going too far afield. I would really like to hear a whole album of this type of music, but clearly Wintherstormer doesn’t want to just be another entry in the already crowded Berlin school field, so kudos to them for daring to be different.